Last week, a ceremony took place at the memorial sundial at the Bosworth Battlefield Heritage Centre to commemorate those killed at the Battle of Bosworth on 22nd August 1485. 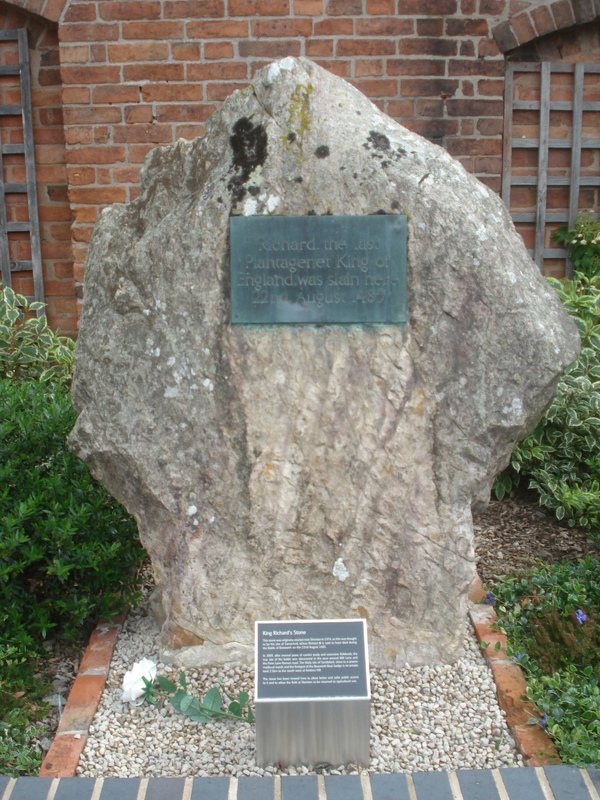 This was the first anniversary to take place at the scene of the battle since the discovery of the body of King Richard III at the site of Greyfriars Church, Leicester in September 2012. Richard III was killed at the Battle of Bosworth as he tried to defend his reign of just over two years against a claim to the throne of England made by Henry Tudor, Earl of Richmond. Rather than lay wreaths at the sundial, participants at last Thursday’s event held a rose-laying ceremony. The roses make reference to the Wars of the Roses (1455-1487), the civil war between Richard III’s house of York (white rose) and the house of Lancaster (red rose), from which Henry Tudor descended. With the death of Richard III, the Battle of Bosworth became the deciding battle of the Wars of the Roses, yet assessment of Richard’s reign and its validity has continued to divide people to the present day. The discovery of Richard’s body will help to answer some questions about the fate of the King at the battle, but there are also questions surrounding, and revisions to, assumptions about where specific events took place leading up to and during the battle. These are reflected in the memorials on the battlefield. We have recorded 18 memorials to the Wars of the Roses, eight of which commemorate Richard III himself. Of the memorials to Richard, three are sited within the battlefield area and include the sundial at which last Thursday’s anniversary ceremony took place. The sundial commemorates Richard alongside other combatants and is located at the top of Ambion Hill. 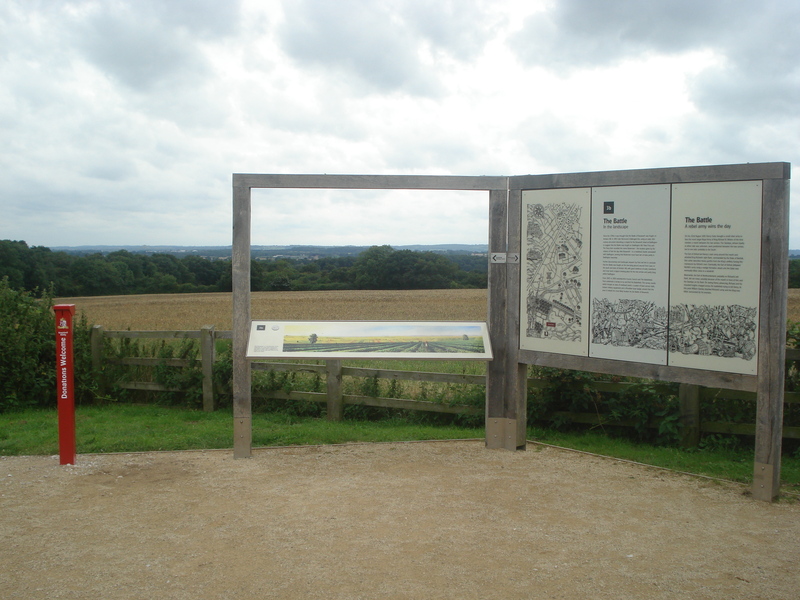 Until 1985 it was thought that the battle had taken place on Ambion Hill, but historians now agree that the likelihood is that Richard’s troops gathered on the hill early on in the battle and that fighting took place to the south west of the hill. 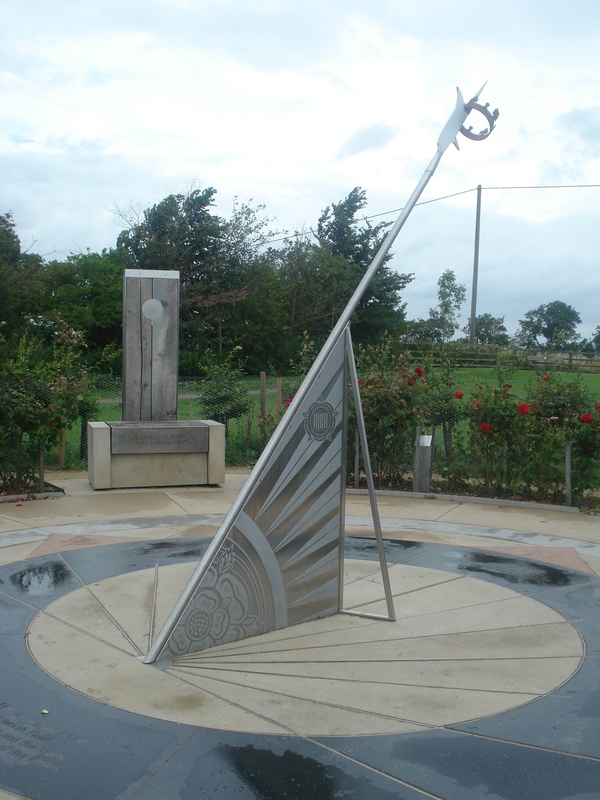 The sundial marks the points of the compass and distances to other battlefields of the Wars of the Roses. A central gnomon, the time telling device, is topped with a crown, and at ground level is an inscription which tells the story of the battle, based on that of Polydore Vergil, an Italian at the court of Henry VII. Around the outer dial are three thrones bearing the names of Richard III; Henry Tudor, Earl of Richmond; and Thomas, Lord Stanley. Stanley’s throne is shorter than the other two, and it may seem like a surprising addition, but he held sovereignty of the Isle of Man as the ’King of Mann’, and his action at the battle in support of Henry is thought to be decisive. Further down the hill towards the south west of Ambion Hill is ‘Richard’s Well’ . 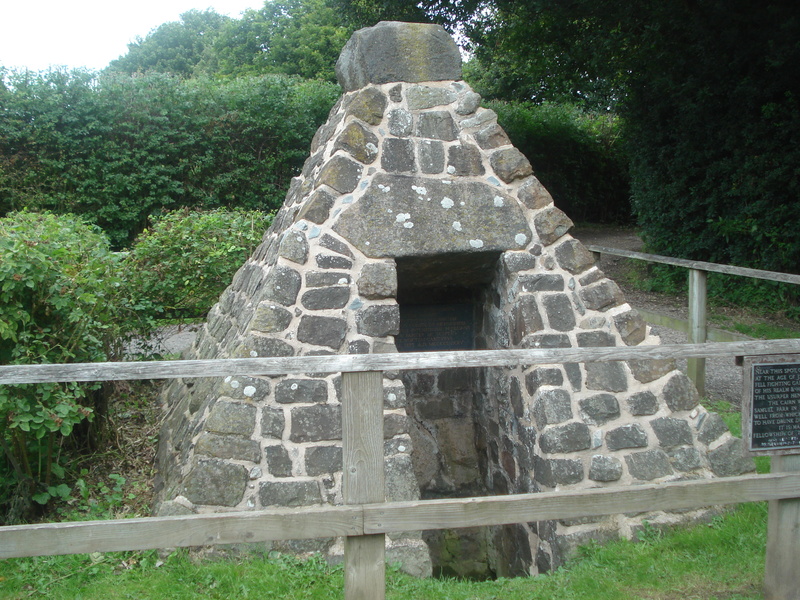 This is a pyramid of stones erected in 1813 over a natural spring. The well commemorates the site where Richard is thought to have drunk spring water either before or during the battle. However, the historian Peter Foss notes that ‘there are several springs on Ambion’ (Foss, 1998, p23), raising the question of which would be the most likely site. In his book, The Field of Redemore, The Battle of Bosworth, 1485 (Kairos Press, 1998), Peter Foss reassesses evidence for the battle and notes that sixteenth century chroniclers were inclined towards a Tudor bias (1998, p.12). Since the 1980s, the Richard III Society in particular has gone some way to redress any bias against Richard by erecting memorials to him, even though the facts regarding their locations have been revised. The memorials we have recorded so far, commemorate the Battle as a whole or Richard III’s loss. We have yet to record a memorial which celebrates Henry VII’s victory. Apologising for a war memorial? 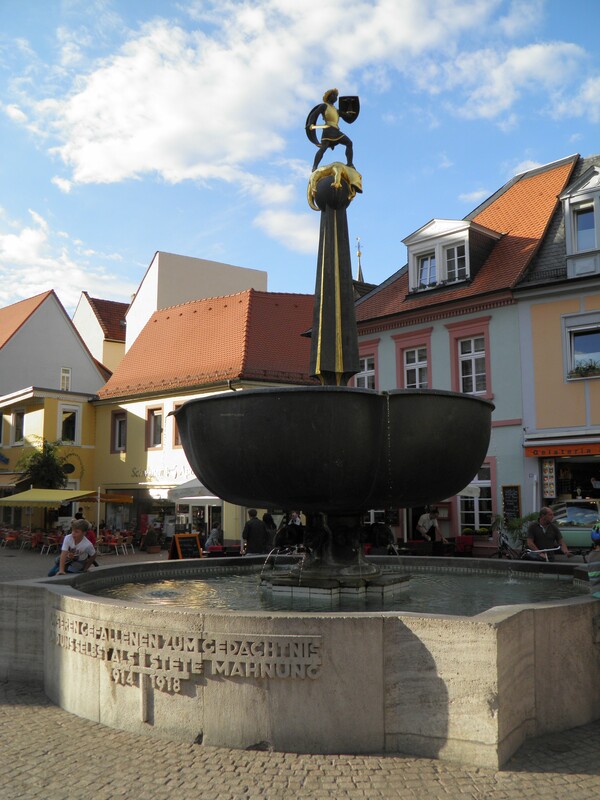 On holiday in Germany in September 2012, I noticed the St Georgsbrunnen, a striking war memorial fountain in the city of Speyer: water flows into a stone basin from a large metal bowl surmounted by an obelisk topped by a statue of St George slaying the dragon. 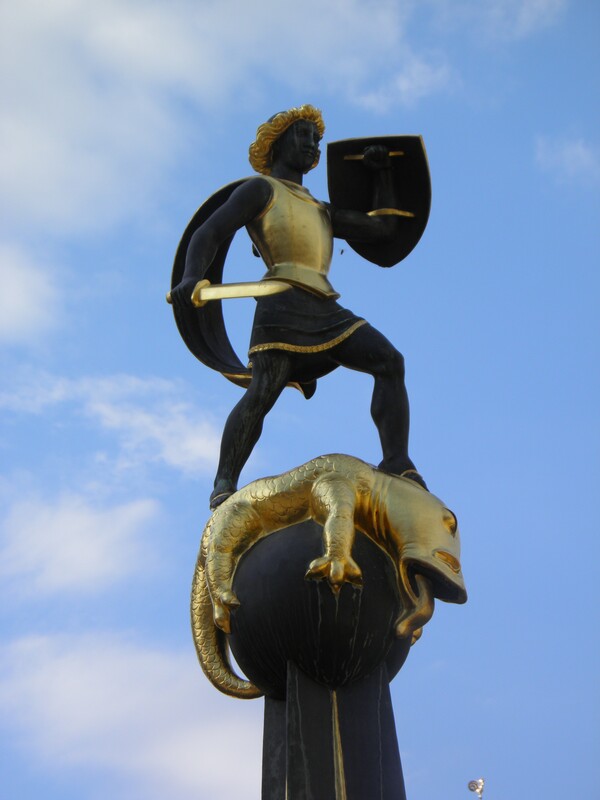 Although St George is strongly identified as England’s patron saint, he is also one of Germany’s; he is also associated with soldiers and chivalry, so the use of his image on a German memorial should not be considered particularly surprising. Speyer First World War memorial, Germany (©Roger Smither). This struck me as sufficiently unusual to invite a closer look. Do the inscriptions and reliefs on the fountain obviously invite controversy or demand an apology? There are four inscriptions on the stone basin of the fountain, three of which were originally illustrated by accompanying relief sculptures. The main inscription reads ‘UNSEREN GEFALLENEN ZUM GEDACHTNIS UND UNS SELBST ALS STETE MAHNUNG 1914+1918’, which may be translated as ‘In Memory of our fallen and as a reminder to ourselves’ – a common sentiment for a war memorial, and scarcely contentious. The other three inscriptions are all quotations from songs or poems. St George and the dragon, Speyer First World War memorial, Germany (©Roger Smither). One offers the first two lines of Der gute Kamerad (The Good Comrade), a poem written by Ludwig Uhland in 1809 – ‘ICH HATT EINEN KAMERADEN, EINEN BESSERN FINDST DU NIT’ (I had a comrade, you won’t find a better one). Set to music by Friedrich Silcher In 1825, the poem long pre-dates the ideologies of the 1930s, and remains the traditional mourning song of the German Army. The accompanying relief illustrates the line – one soldier falls wounded in a marching group. The second reads ‘DEUTSCHE FRAUEN, DEUTSCHE TREUE’ (German women, German loyalty), and is taken from the second verse of the Deutschlandlied – ‘Deutschland, Deutschland über alles’ – written by August Heinrich Hoffmann von Fallersleben in 1841. This verse is little known these days, but it is ignored more because of its male chauvinist tendencies than because of its nationalism: it equates women with wine as inspirational pleasures of traditional Germany. This time, the accompanying relief shows two women digging in a field, to symbolise the home front war effort. The third inscription reads ‘DEUTSCHLAND MUSS LEBEN AUCH WENN WIR STERBEN MÜSSEN’ (Germany must live, even if we must perish), which is the closing line of each verse of a 1914 poem, Soldatenabschied (Soldier’s Farewell) by Heinrich Lersch. This does sound quite nationalistic, but English readers will recall Rudyard Kipling’s very similar line ‘Who dies if England live?‘ which comes at the end of verse 4 of his poem For All We Have and Are, also written in 1914. On the fountain in this case the accompanying relief is missing, but it is possible to find reproductions of old postcards on the web, where it appears that the sculptor had depicted two soldiers in a trench. Modern inscription near the Speyer First World War memorial, Germany (©Roger Smither). With the help of Christa Rinner, a researcher based in Karlsruhe, I have learned that the memorial fountain in Speyer is the work of the architect Karl Latteyer of Ludwigshafen and a British-born sculptor named William Ohly, who both attended its official inauguration on 29 June 1930, and that – although there does not seem to have been any specific event in Speyer to prompt it – the explanatory plaque was added in 1996, when the need to replace some of the piping led to a full-scale restoration of the fountain. There may not have been such an episode in Speyer but it remains true, of course, that war memorials can be controversial, and they have undoubtedly been the focus of protest elsewhere. Demonstrators in the former Eastern Bloc have often targeted Soviet war memorials with either hostility or derision, including an episode in Bulgaria in 2011 when a street artist painted the figures on the Soviet memorial in Sofia to represent American comic-book characters. The Coalition invasion of Iraq in 2003 prompted a French protestor to spray-paint ‘Rosbeefs Go Home’ and other slogans on the cross of a CWGC cemetery at Etaples, and there was outrage in India in 2012 when protestors in Mumbai were photographed attacking the Amar Jawan Jyoti memorial which commemorates two Sepoys executed during the 1857 uprising. More recently, the Animals in War and Bomber Command memorials in London were subjected to graffiti following the murder outside Woolwich Barracks of Drummer Rigby, 2nd Battalion, Royal Regiment of Fusiliers. I wonder, do war memorials present political statements in themselves? Why are they used as sites of protest? How often do civic authorities try to defuse objections before they are raised? It strikes me that the politics of war memorials could be an interesting topic for further research. Last Saturday, the 2013 Chelsea Flower Show came to an end. It was a week during which exhibitors celebrated the centenary of the event, which was first held at the Royal Hospital grounds in Ranelagh Gardens in 1913. The 2013 show was in fact the 92nd Chelsea Flower Show, rather than the 100th, as the event was cancelled during the First World War in 1917 and 1918, and also for the duration of the Second World War. In RHS Chelsea Flower Show: A Centenary Celebration, the illustrated book published to commemorate the history of the show, the Royal Horticultural Society (RHS) historian Brent Elliott lists some of the names of the horticultural firms that exhibited in the first show of 1913. These include Notcutt Nursery, founded in 1897 in Suffolk, and particularly famed for its trees and shrubs. The 1914 Chelsea Flower Show was held three months before the outbreak of the First World War. Notcutt Nursery was busy that year, and in April had exhibited at the RHS fortnightly meeting in Westminster, at which ‘a much admired shrubby plant certificated was Mr Notcutt’s Prunus Blirisana (The Times, 8th April 1914, pg 11). In 1915 however, the presence of the war was felt at Chelsea, and the Royal Horticultural Society used the show to seek funds for the newly founded RHS War Relief Fund. This fund had the specific purpose of raising money to buy seeds, plants, trees and equipment to replant the already devastated gardens and countryside of France, Belgium, Romania and Serbia. Funds and supplies were to be distributed as and when the war ended. In 1916, at the last Chelsea Flower Show to be held during the war, changes to Show included the absence of the great tent, ‘for the reason that the active young men who erected it and climbed the big poles are now in the Navy’ (The Times, 23rd May 1916, pg 11). 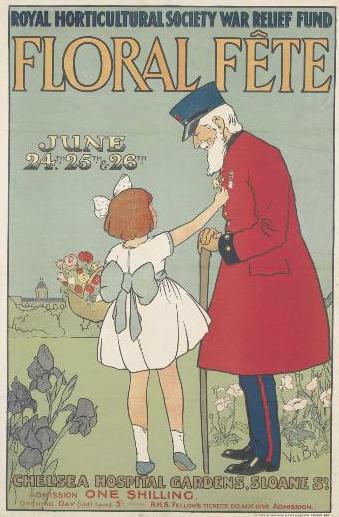 The loss of men from the estate gardens and nurseries to war service contributed to the cancellation of the Show in 1917 and then again in 1918. It is possible that some of the gardeners, growers and staff of Notcutt Nursery who attended the first Chelsea Flower Shows in 1913 and 1914 and the RHS show at Westminster in the Spring of 1914 are among those commemorated by the Notcutt Nursery war memorial, which is a sundial in a garden of remembrance at the present day nursery. 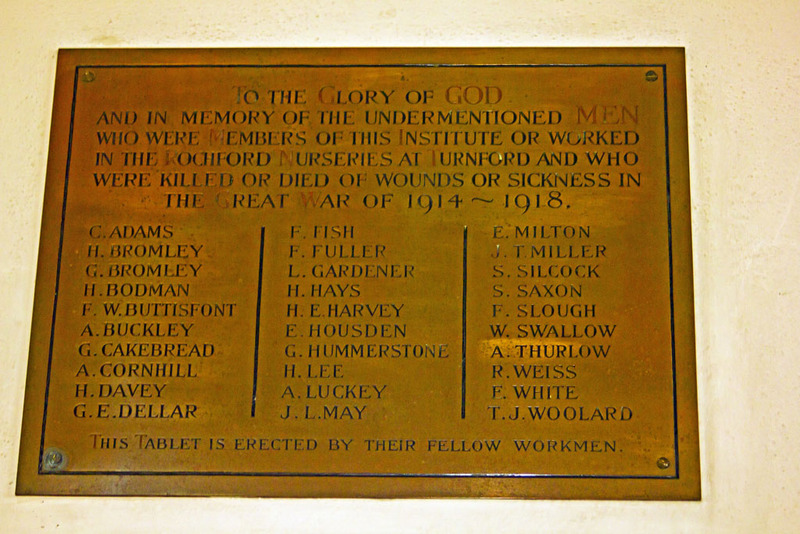 This memorial records the loss of six members of staff during the First World War and two during the Second World War. 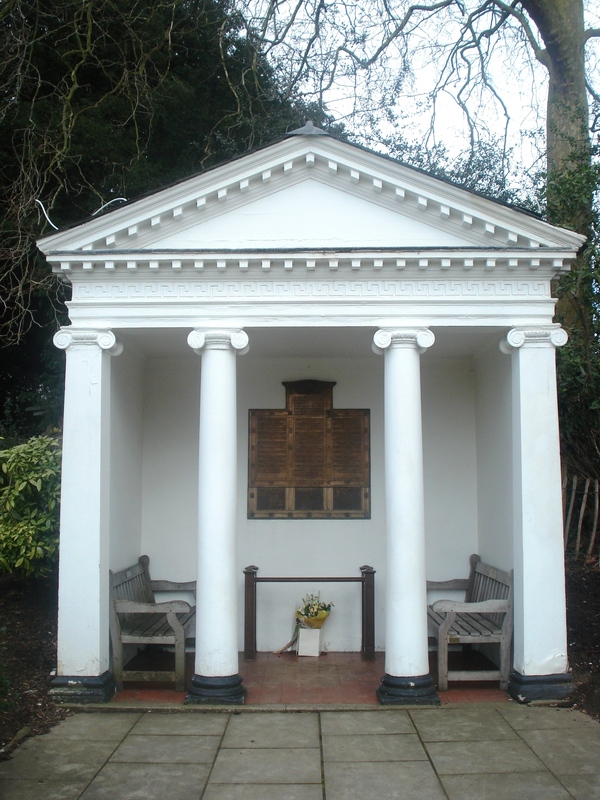 The memorial to the Hertfordshire floral nursery of Thomas Rochford in Turnford lists the names of thirty members of the Turnford Institute and Rochford Nurseries staff who were ‘killed or died of wounds or sickness’ during the war. The nursery had competed in the Roses category at the Chelsea Flower Show of 1916. Goldsworth Nursery, founded in 1790 in Woking, exhibited regularly at the Rhododendron Association shows at RHS Westminster. The nursery lost eighteen men. Country estates also suffered from the loss of their garden staff. 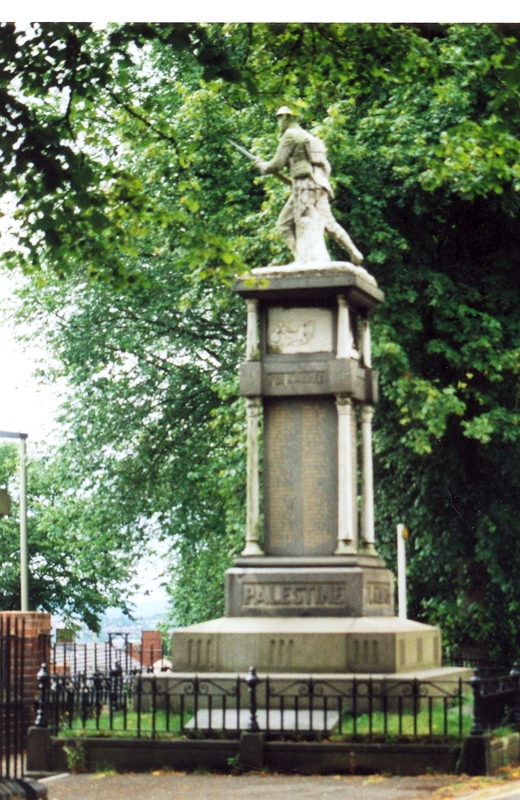 The memorial at Backwell Hill House, near Bristol, commemorates three casualties. Christopher George Ball, ‘second gardener on this place’ and William Henry Lock, ‘garden boy on this place’ are named alongside William Patrick Garnett, the son of the owner of Backwell Hill House. In Cornwall, the gardens of Heligan House are maintained today as a memorial to the gardeners of the estate who went to war. 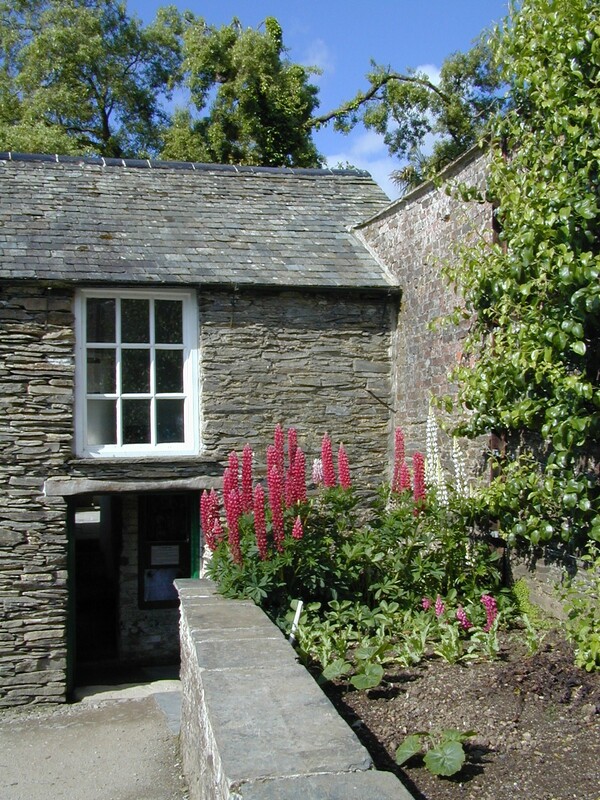 Visitors to the garden can still come across The Thunderbox, the garden toilet and store, which bears the signatures of garden staff under the portentous date of ‘August 1914’. The memorials of the RHS School at Wisley in Surrey and the Royal Botanical Gardens of Edinburgh and Kew show the loss of a generation of horticultural talent to the First World War. Edinburgh lost twenty men, whilst at Kew, thirty seven members of staff are listed as killed above the Kew Guild motto ’Floreat Kew’ (Flourish Kew). At ZSL London Zoo, two staff members, Albert Staniford and Robert Jones, are commemorated with the profession ‘gardener’. Professional gardeners are also named on community memorials, such as that in Elie, Fife, where two casualties hold the profession of ‘gardener’. At The Kings School in Canterbury the word ’Hortulani’, Latin for gardener, is next to the name of Harry Rogers. Although the First World War led to the loss of many RHS student gardeners and nursery and estate staff gardeners, the RHS vision of rejuvenation by horticulture greatly assisted the replanting of the countryside and provided food supplies in France and Belgium after the war. The RHS War Relief Fund distributed seeds, saplings and grown trees which were transported by the British Red Cross from 1919 onwards, and many of the trees planted at this time are still growing today. Notcutt Nursery also returned to exhibit at the 1921 RHS Show of British-grown fruit in Westminster. Despite the nursery’s staff losses during the war, continuity was shown as the nursery was awarded the trade group Silver medal for fruit, where ‘the chief strength lay in the pears, which were exhibited in great variety.’ (The Times, 5 Oct, 1921, pg 8). The 16th and 17th of May this year mark the 70th Anniversary of Operation Chastise, better known as the “Dambusters” raids. These raids saw 19 modified Avro Lancaster bombers of 617 Squadron embark on a daring mission to destroy the dams within the Ruhr valley, in an attempt to cripple German industry. 617 Squadron was formed for the specific purposes of this mission and was equipped with a bespoke weapon, the now famous Bouncing Bomb codenamed ‘Upkeep’, designed by Barnes Wallis. This highly specialised mission required training and preparation unlike anything the crews had previously experienced. To prepare, the crews were sent to practise their technique at suitable locations within the UK. Although the crews did not know the specifics of their mission during the training phases, it was quite obvious that they had been selected for a unique task due to the very specific topography of the practice locations. The crews were sent to four different locations to practise low level flying over water and precision targeting. We have recorded three memorials to these events which are located on the practice sites. Eyebrook Reservoir in Stoke Dry, Rutland was mocked up with canvas towers to resemble the profile of the German targets. It was also used beyond the raids for further training with the ‘Upkeep’ bomb. 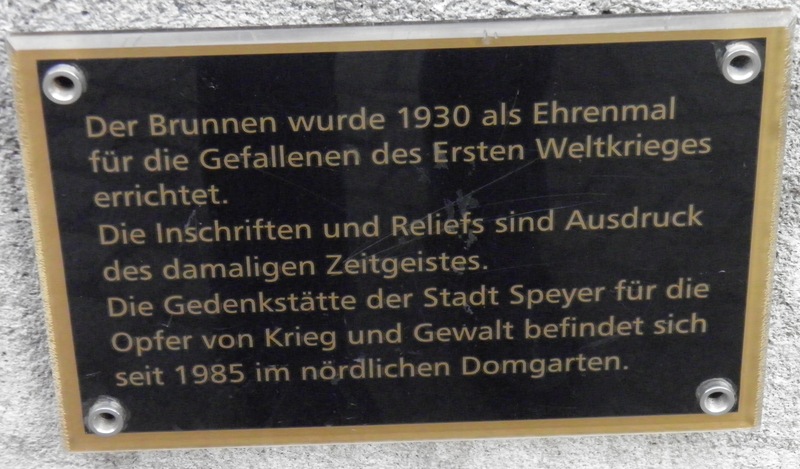 A plaque at the site commemorates the reservoir’s importance in preparing the crews for the raids on the Mohne and Eder dams in Germany. 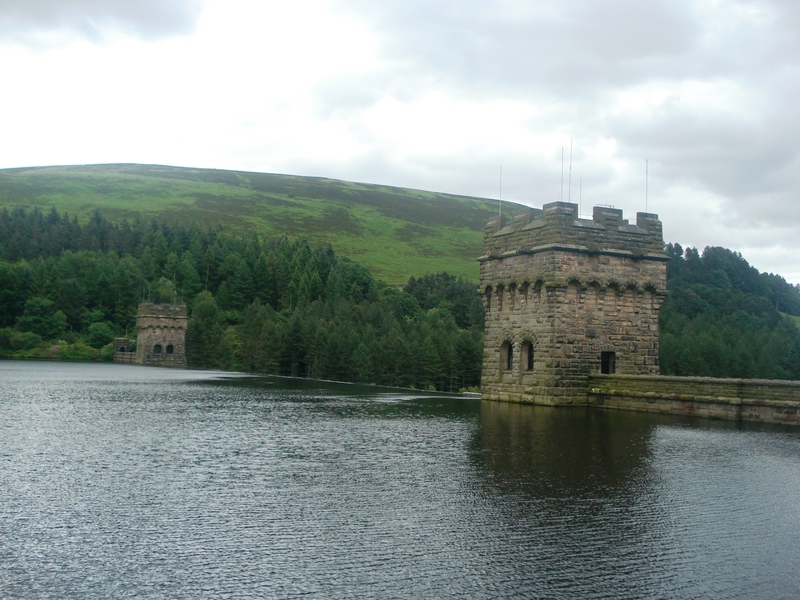 At Derwent Dam (14270) in Derbyshire, chosen because of its close resemblance to the Ruhr dams, there is a stone tablet inside the gatehouse recording the use of the dam by 617 Squadron. 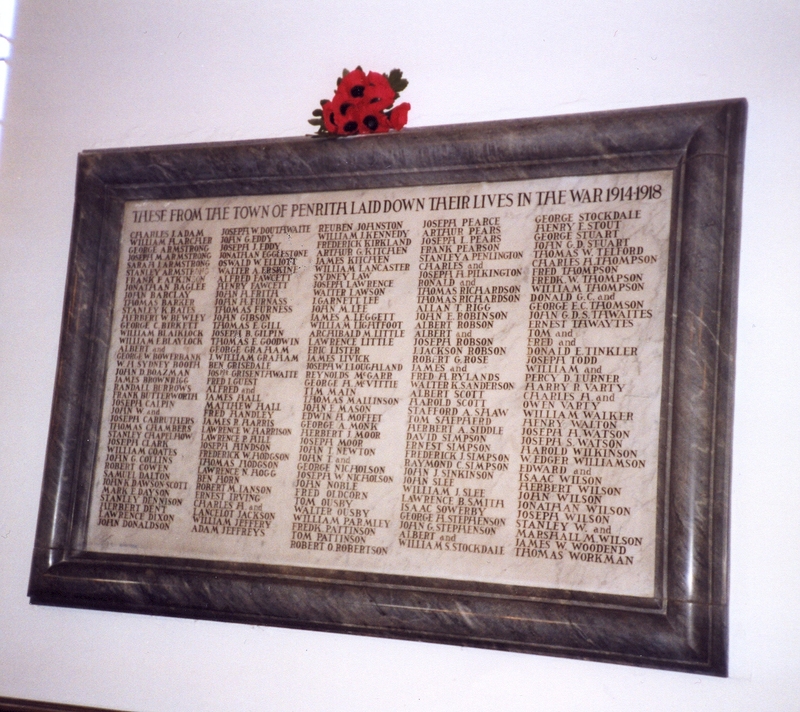 In 1988, a further tablet was added, commemorating those who died during the raid. In 2008, a 65th Anniversary event was held at the Derwent Dam, involving a flypast by a Lancaster from the Battle of Britain Memorial Flight, which made low level passes over the dam at 100ft. The exploits of 617 Squadron during Operation Chastise inspired their famous title of the Dambusters, and earned them a reputation as a precision bombing squadron for future operations. 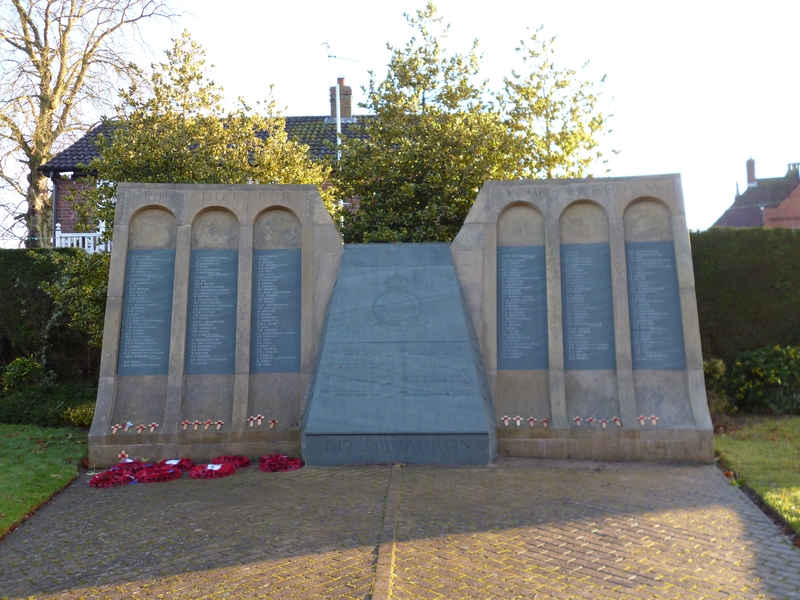 The names of the 204 men of the Squadron who died in raids during the Second World War are inscribed upon the memorial wall to the Squadron at Royal Gardens, Woodhall Spa, Lincolnshire. The wall has been purposely shaped to resemble a dam. Yesterday, veterans of the Arctic Convoy were presented with the newly issued Arctic Star, awarded in recognition of their bravery during the campaign to carry military supplies to Russia during the Second World War. The presentation ceremony took place at the memorial at Loch Ewe in Wester Ross, Scotland, with over 30 of the surviving veterans in attendance. 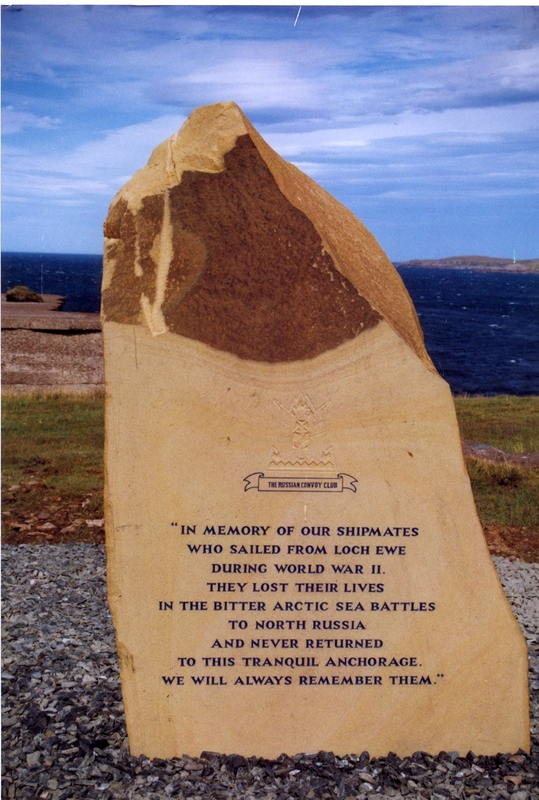 Loch Ewe was the place of departure for many of the ships that took part in what is recognised as one of the most arduous campaigns of the Second World War. We have recorded 17 memorials which commemorate the Arctic Convoy. These include the ship’s bell from HMS Cassandra, which was presented to the D Day Museum in Portsmouth in 1999. The bell is mounted above a plaque which is inscribed with the names of the 62 crew who died when HMS Cassandra was torpedoed 11th December 1944, shortly after the ship left Murmansk on the return leg of her journey. 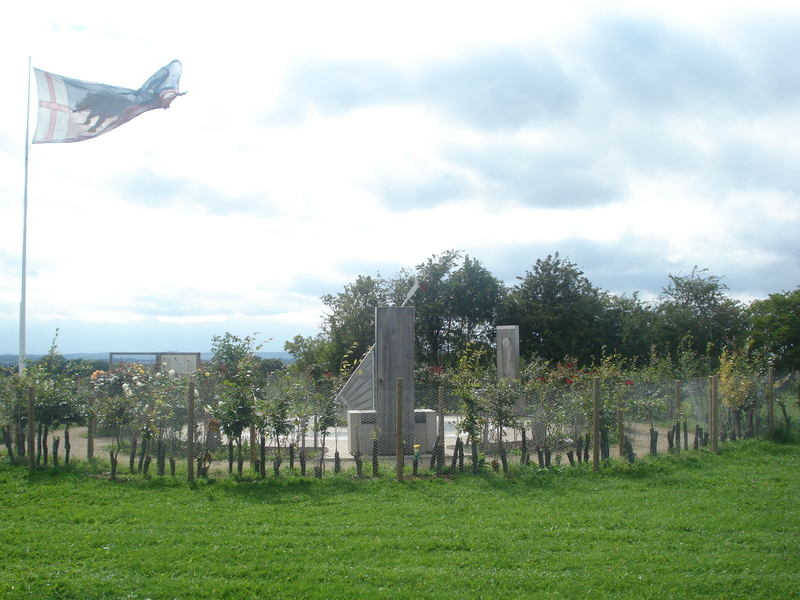 The Fleet Air Arm memorial, which is a sculpture of the figure of Daedalus, also commemorates the Arctic Convey and the role the Fleet Air Arm took in supporting Convoy ships, 1941-45. 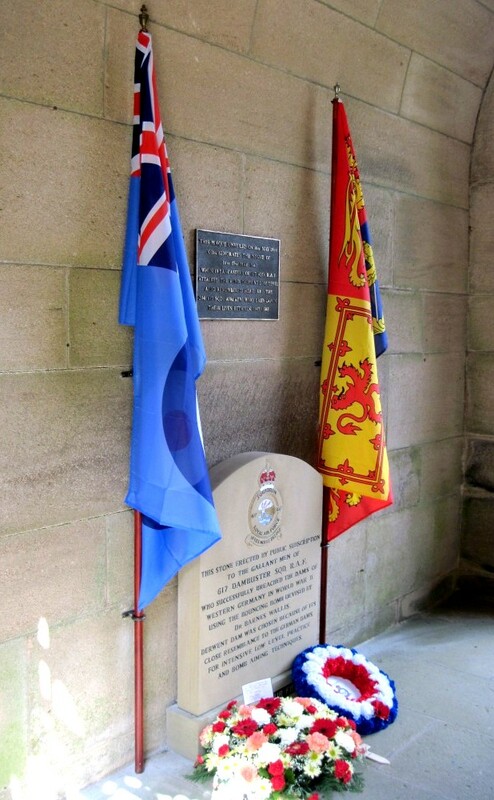 The Arctic Convoy is also commemorated in the Queen Elizabeth High School Book of Remembrance in Hexham, by the Ensign of HMS Bellona and by the Arctic Convoy Stone of Remembrance in Lyness, Orkney, another site of departure for the ships. Looking at war memorials, especially in small communities, I am often struck when the same family name recurs. Might they be brothers, or cousins, or even father and son? Local research, aided by the Commonwealth War Graves Commission website, can often provide answers and it is encouraging to see the number of local booklets published in recent years to honour the fallen of their communities. After 14 years volunteering for IWM’s War Memorials Archive (formerly UKNIWM), I am almost convinced there is no war memorial which can correctly be described as unique. The other day though I was updating the record for the Men of Penrith, in Cumbria and came across thirteen instances where there was a forename followed by ‘and’, and either one or two further names followed by the family surname, eg ‘Ronald and Thomas Richardson.’ covering two lines, but distinguished from the next entry, another Thomas Richardson. Does anyone know of any other community memorial on which the names of relatives are shown this way? Historic Scotland have recently produced a short guide entitled The Repair and Maintenance of War Memorials. This is a free guide which gives custodians valuable information about the environmental risks to war memorials and the types of materials used to maintain them. It also makes recommendations for the most appropriate courses of action for maintenance and conservation. Along with this guide, you can also seek expert advice on any matters relating to conservation of war memorials from War Memorials Trust, which is the UK advisory body for the conservation and restoration of war memorials.